Tidewater Chinese School (TCS) is a certified Presidential Volunteer Service Award (PVSA, 总统义工奖) organization that recognizes and awards members (家长，学生，助教，老师，或以家庭为单位) for their outstanding achievements for volunteer service. We also help to apply for President’s Volunteer Service Award if you are qualified. TCS TA class hours which must be certified/approved by the principal or board of advisors. TCS event service hours approved and certificated by principal or board of advisors. ○ Volunteer to help with tasks at the First day of school –> 2 hours. ○ Represent TCS and participate in Asian Festival and/or International Children’s Festival —>2 hour. ○ Volunteer to help with TCS Chinese New year event —->2-4 hours. ○ Volunteer to help with TCS Moon Festival event —>2 hours. ○ other TCS related activities at the discretion of principal, board of advisors, or teachers. TCS qualified hours is based on hours served ending on May 15. Award （奖励日期）: Presidential Volunteer Service Award to be given out during closing ceremony of each school year. Parents of applicants or applicants themselves will send an email to TCS Principal indicating their desire in submitting applications for PVSA. TCS will qualify the applications based on TCS documented service hours and other certified service hours from other organizations. 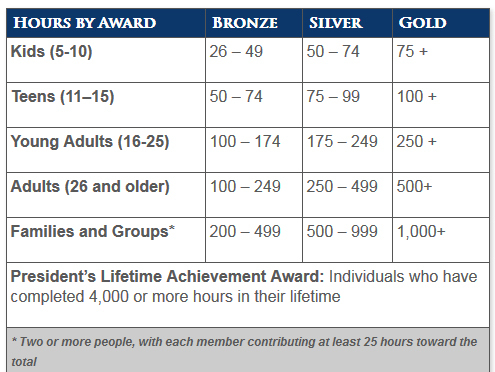 TCS documented service hours should constitute greater than 50% of total service hours. Students can enter their hours by following this PDF instruction. Once all applicants qualification are determined, TCS will upload the service hours using pre-defined excel spreadsheet or user defined accounts to PVSA website. The approval is being determined by the PVSA based on the applications submitted by TCS.